Windows could not connect to the Group Policy Client service. The problem prevents standard users from logging on to the system. Though we are not entirely sure on the root cause, a pattern was noticed which is almost the MO for this error. The windows updates run on a schedule automatically and upon completion, a reboot is initiated. If the computer crashes during the reboot sequence (for any reason), this error starts occurring and the user is notified that the last shutdown was unexpected. Most probably during the crash reboot, the important registry settings got destroyed or corrupted and the Group Policy Client no longer is aware on the process to start. Without further stressing on the reason for this error, lets delve into the fix. Though most websites suggest you to reinstall your OS again, let me assure you that, it is NOT at all required. Note : Only the administrators can log in and provide the fix. Other users are not allowed to log in. 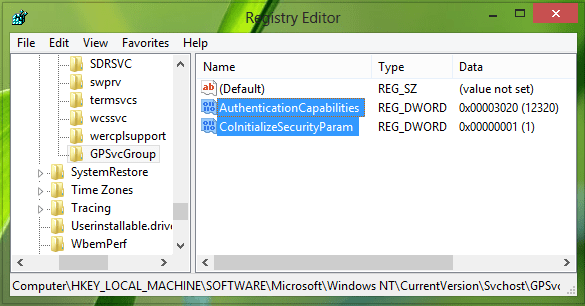 On a high level the fix involves restoring the registry settings using the Registry editor. 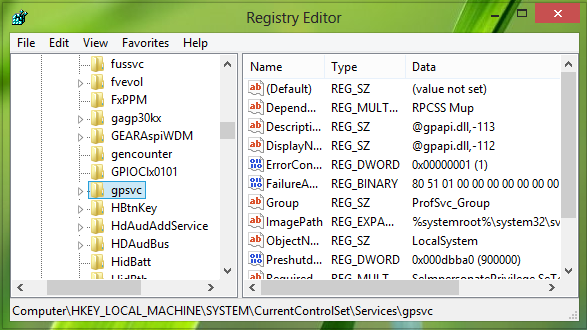 To start off open the Registry editor from the run window (hold windows key and the letter R) or alternatively by searching Run. Enter regedit in the run window which appears and click on the OK button. If any additional pop up window appears asking for permission, click on Yes. and verify that the gpsvc folder along with a parameter named ImagePath is present in this folder. 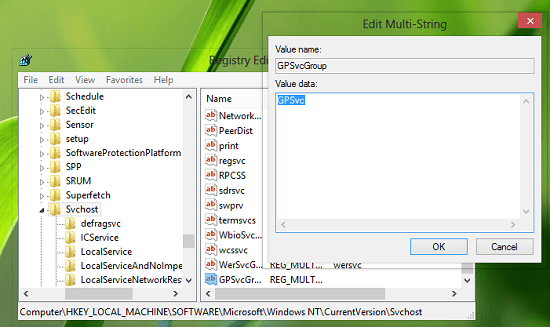 The parameter value should end with something like GPSvcGroup as this ImagePath parameter defines how group policy client services are started. If the values are as stated, do not touch anything else here and proceed with the following steps. You will notice that the GPSvcGroup service missing from the list on the right in the SVCHOST folder along with the GPSvcGroup sub-folder on the left. The fix would be to create the missing variables and folders. Creating the missing variable : To do this right-click on the blank space on the right pane and chose new and multi-string value.A new variable would be created. Name the variable as “GPSvcGroup”. Now double click on this newly created variable and under Value date, set the value to “GPSvc” and click on OK. Creating the missing sub-folder : Right click on the Svchost folder and click on new and then Key. Name the new sub-folder to GPSvcGroup. Creating missing variables in the sub-folder : Two variables have to be created in this folder and can be done by right clicking in the blank space on the right side pane and clicking on New and selecting DWORD (32-bit) value. Note : Irrespective of your OS being 32 or 64 bit, only DWORD (32-bit) has to be chosen. Now name this new variable “AuthenticationCapabilities”. Double click on the variable to set the value to 3020 in Hexadecimal format. Click on OK. Similarly create another variable (same DWORD 32 bit) and name it as “CoInitializeSecurityParam”. Set the value to 1 in hexadecimal. You are now done with the settings. Just close the registry editor and RESTART your computer. Hope this has helped you in solving the issue. If it is not, just comment on the difficulty you are facing and we will help you with the resolution. In W10, When I get to the gpsvc > image path, it ends svhost.exe-k netsvcs. What to do? This started after upgrading to 10 from 8.1 I see lots of people posting but no solutions except yours. You might get a lot of hits if you specify a W10 fix.